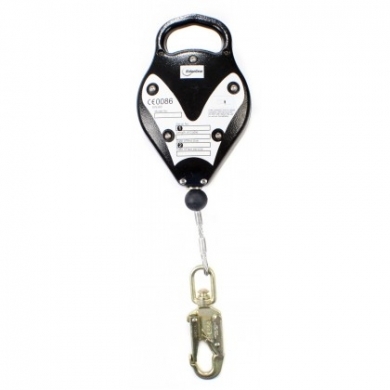 A lighter weight and smaller block than the RGA2, the RGA26 is also a multi purpose fall arrest block, which allows uninhibited movement during normal working activity. The carrying handle is part of the cast alloy housing and can be connected to the anchorage point using soft slings or a karabiner. The RGA26 is used throughout the industry to provide semi permanent protection in work areas, and is also used on lorry sheeting gantries in conjunction with a beam trolley (RGBT 1). For self-connecting to the block, it is recommended that the operative uses an extension strop (RGL4) in order to ease the task. The RGA26 has a working length of 6 metres.